Have you heard the news? Card games are big business. As is toys-to-life, unless you're Disney. But what happens when the two come together? The answer is Skylanders Battlecast, Activision Blizzard's new battle card game, which takes many of the principles of Hearthstone and applies them to the Skylanders universe. Unlike Hearthstone, however, you can buy physical cards and bring them into the game using the power of augmented reality. You'll recognise many of the monsters from Skylanders which make up many of the cards, with the rest consisting of various spell, gear and relic cards. Battlecast launches today for iOS, Android and Kindle Fire, and we've pulled together a few key facts you need to know. Hearthstone is a great game - I should know, I was addicted to it for long enough - so there are definitely worse inspirations to draw from. Skylanders Battlecast feels like Hearthstone for younger players, combining the one-vs-one card battling gameplay with characters from the immensely popular Skylanders franchise. The aim of the game is also pretty familiar: knock out your opponent before they knock you out. 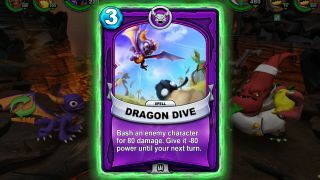 Where Skylanders is noticeably different is in its use of purchasable real-world cards that can be "brought into" the game, and will be available in shops from May 27. Battlecast's augmented reality feature brings cards to life through the camera. When you do so, a 3D animated model will appear over the card, letting you view it by moving the device around. You can then add it to your collection to be used in the game. Battles are different too in that you watch the animation between the monsters taking place on screen - as opposed to cards just hitting into one another when someone deals damage. We were told there will be more than 300 cards available from launch date, appearing in both physical and digital form. The majority of cards can be found in booster packs, but we were told that some cards which feature in the game's starter pack will be digital-exclusives. There are also special gold and silver variants of some cards. In Battlecast, you can level up cards from level 1 to 20, however a silver card will automatically start of level 10 while a gold will come into play at level 20. Battlecast has two main modes: a campaign and a PvP multiplayer. The campaign mode consists of "over 16 missions", we were told, which take place across eight different realms. That's a good place to hone your skills, but it's in the VS mode where you'll be having the real fun. Casual PvP mode lets you play for fun without losing rank points (a good place to test new decks), or alternatively you can take on people you know using the Friends List. The game has been designed to consider newcomers to the world of Skylanders/card battling. To that end, it offers to automatically build a 30-card deck for you if you wish. In fact, you never need to go into the Collection Book if you don't want to. The Collection Book looks particularly Hearthstone-esque in the way it arranges cards by their types and strengths, and it's here where the strategic depth lies for those who want it. Each Skylander has a play style: some cards are better at dealing out heavy damage; some heal; others are good for soaking up damage. Over time you'll find a strategy you like. Can I swap cards with friends? Obviously there's nothing stopping you from swapping the physical cards with other people, but once a card has been registered to an account, that's it - it can't be registered to another. Although the app itself is free, the booster cards are going to cost you. You can do this digitally using the in-app currency of coins, which can be earned through battles or bought with real money. Alternatively you can purchase physical booster and battle packs. Whichever way you do it, booster packs cost $4.99/£4.99 and come with eight cards, while battle packs will cost $9.99/£9.99 and give you 22 cards for your collection. In each battle pack you're guaranteed three Skylanders monster cards and a spell card that can be used with each. And that's pretty much everything you need to know. You can download Battlecast now on iOS, Android and Kindle Fire. Speaking of battles, have you read our Battleborn review yet?